Engleberg, Switzerland: The place I would end my year in 2013, and the most fitting place to bring in 2014. 2013 was a GREAT year for me. It's easily been the best year to date. I've done more this in this year then I've done in the past 3 (in my opinion). By no means has this come easy. As for the down sides, I've been homeless (couch surfing for months). I was living on the brink of termination from my job of 6 years for about 6 months, to finally walk way from it leaving me jobless for another 3 months. I've been without any income, and practically living off savings. However on the upside, I've been probably more profitable than ever. I stumbled across the love which lights my life (accidentally) while traveling through the Untied States with one of my favorite dudes. I produced my very first solo show, with no help from anyone (shout out to Jake and Larry for the show set up). I moved to the west coast. I left my old job and landed a new one. I was able to see my favorite professional and college football games live, on 2 different coast. I spent my birthday in the Bahamas, and spend the years end in Switzerland with the woman I love. 2013 was definitely a "give and take" kinda year. An ebb and flow, if you will. How do I honor all this... I know how. Paint. I hadn't painted outside since I learned how to use oils. I remember having to do it for class, and absolutely hating it. Once I began to gain steam and paint indoors, in the company of all my tools (projector, computer, lighting, etc), I found myself unnoticeably relying on these tools. Feeling like I've artistically "forgotten where I come from", I felt an opposing and alarmingly overwhelming need to rediscover my foundation. 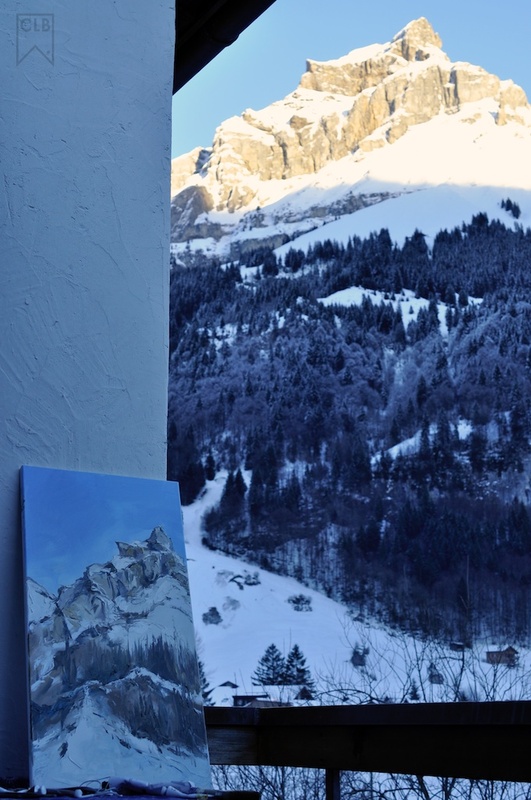 What would be a better place to paint outside than in Switzerland.. right? I mean, nothing test your ability more than painting in 10 degree weather, for a shortened amount of time with light because the mountains block out the sun. Or to paint on palette paper, when you only know glass. Did I ever mention how often the scenery changes color and shadow location in the mountains? No? Well, the colors and the shadow locations change significantly, if I didn't make that clear already. In closing. The painting turned out great to say that I couldn't feel my fingers or toes. I ended up leaving it in the hands of Claudia and Rolfe Müller, (My girlfriends parents) as a thank you for all they did for me/us, and all the accommodations they made which made my trip to Switzerland memorable. This was the first painting I've ever done outside the country, and because of this experience... wont be the last.